Another paleo week down! Honestly, this is a lot easier to do than I thought! It requires a little creativity on occasion, but I’m really enjoying eggs and bacon for breakfast and almond milk in my coffee every morning. Plus, I’m getting much more versed in what it means to eat a paleo diet, so it’s getting much easier to explain to people what it all means. I can pick two, right? I’m picking two. The truth is, there have been way more than two incredibly delicious meals this week, but let’s not belabor how spoiled I am at dinner time. So I’m picking one home cooked meal and one meal out. Over the weekend after taking one of the LA Conservancy’s walking tours through downtown Los Angeles, we spent the rest of the day wandering around downtown… an old used and collectable book store, the fabric district, and the arts district. 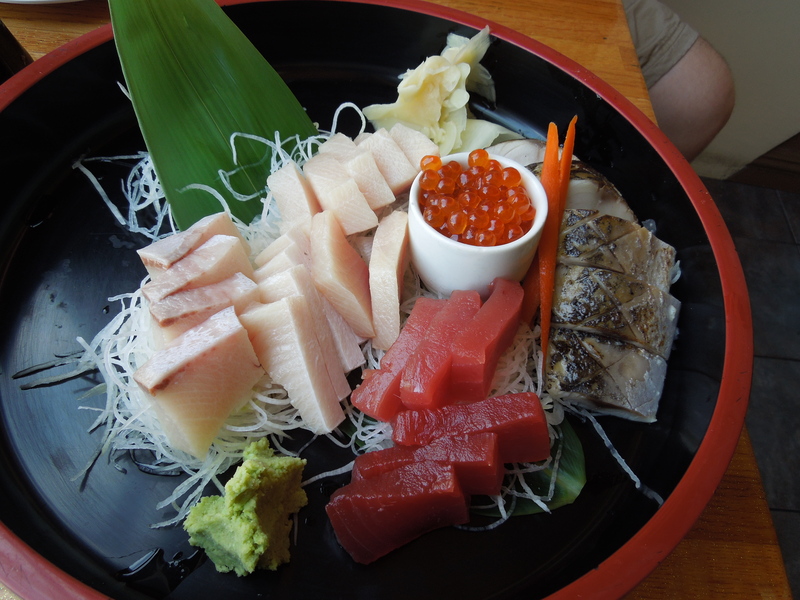 We stopped at one of our favorite sushi spots for lunch, and since rice is out for paleo we ordered a mouth watering collection of sashimi. Yum!. Then, a few nights ago the hubby brought home a flank steak, grilled it to perfection and put together a sort of broken down fajita. We had the steak with roasted zucchini eggplant, and peppers. I even got to use the leftover guacamole for a cobb salad the next day for lunch, so I’d call that a double success! Ok, this has been by far my favorite discovery of this week. For No Tech Tuesday this week we decided to do a little paleo baking. Yes, that’s what I said. Paleo baking. 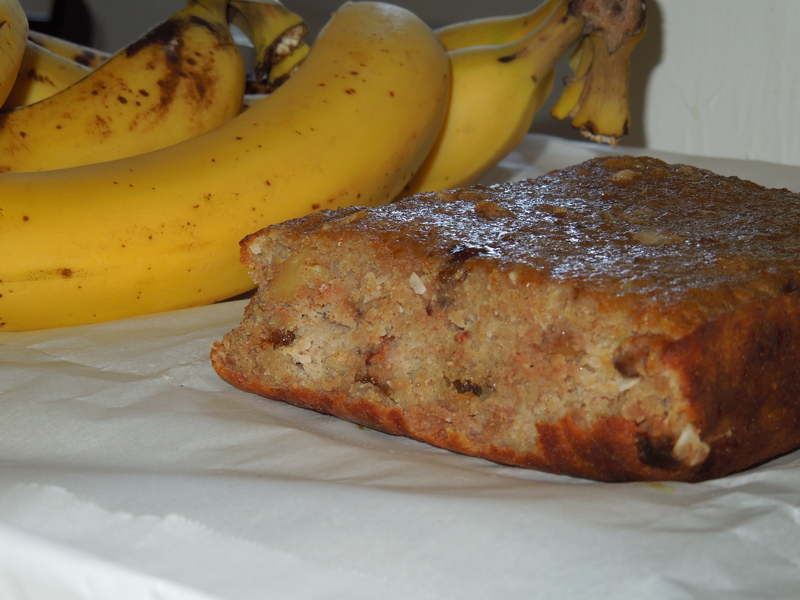 We made this recipe for “‘I Can’t Believe It’s Paleo’ Banana Bread“, and it was so delicious! This week I was learning to limit my snacking. Especially with that delicious banana bread, I wanted to just keep eating more. Same with almonds, they are so easy to grab a handful and snack away! But part of a paleo diet is balancing the kind of foods you are eating. Remember last week when I mentioned there are a lot of gray areas for what foods are ok or not? Some of them (like almonds, and I’m sure all the stuff that’s in that banana bread) are considered “paleo, but…” Meaning it’s paleo, but in moderation. The idea is to limit yourself to the amount of food that you might come across if you were actually in a forest somewhere gathering your meal. I feel balanced. Ok, how do I explain that… My energy level has been pretty consistent throughout each day, which I’m attributing to the lack of my usual sugar highs followed by sugar crashes. I surprisingly have not been having crazy cravings for things though. I think I’m actually getting a reasonable amount of sugar to satisfy my would-be cravings just by eating delicious things like pineapple and mango on occasion. This little “challenge” of mine has been surprisingly easy to adapt to. Now, onward, to week three! I would love to hear about your paleo experiences! Leave ’em in the comments! 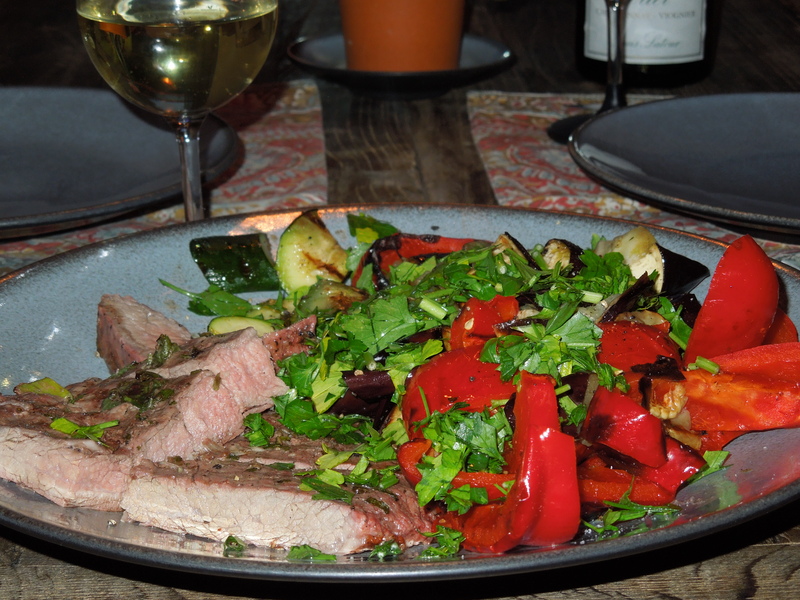 This entry was posted in Food and tagged #almonds, #anecdotalgoat, #bananabread, #eggplant, #fajita, #notechtuesday, #paleo, #pepper, #sashimi, #steak, #sushi, #zucchini. Bookmark the permalink. Wow! I’m glad that you are enjoying the Paleo diet. Do you feel it’s helping health wise? I only know that the diet means lots of meat. lol I am thinking of looking into going gluten free because I heard it helps with arthritis. Do you find it easy to find recipes for paleo diet? I would really love to lose about 10 lbs, would Paleo be a good route? Can you recommend where I can get more info on it? (Maybe if I read more here I will find tips!! 😉 ) Thanks! Health wise paleo seems to be really beneficial! While it’s only been a couple weeks, I do feel like my energy level is much more even and predictable,and my skin has even been clearing up! The recipes aren’t too hard to find, especially with the Eat Drink Paleo blog I’ve been following. It’s my favorite resource for paleo! But mostly we just make sure to cook meat and veggies for dinner and are choosey about what kind of oils we use, but that’s simple to keep track of. Paleo is more of a lifestyle change than a weight loss diet, but that being said it naturally cuts out a lot of things that can cause weight gain or prevent weight loss, so it would definitely be worth giving it a try! I have lost a couple pounds since I started, but not much. Fat is an important ingredient in paleo foods and helps me feel more full since I can’t have bread to fill the corners anymore. 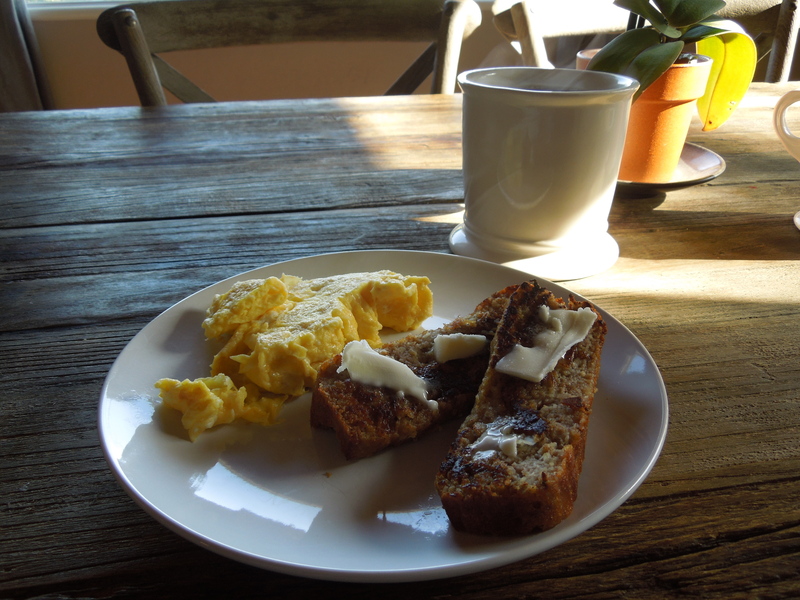 My favorite resource is a blog called Eat Drink Paleo. (I suggest it a lot, but I swear I’m not hired by them to write this or anything, it’s just been the clearest most in depth resource for me to understand exactly what paleo means.) Let me know if you give paleo a try, I’d love to hear how it goes! I’ll have to try the paleo banana bread .. have you tried this recipe – http://www.elanaspantry.com/paleo-bread/ it’s quite good .. I’m about to make my 3rd loaf! Also, .. I sent you an email a few weeks back for the So Cal Lady’s blogger interview. If you got the email (great!) and not interested (no big deal). Just wanted to make sure I at least reached out to you regarding the interview.